The Philistines were nothing but trouble in the days of Samuel the prophet. On one occasion, the Philistine army bivouacked at Aphek while Israel camped to the east in Ebenezer. When the Philistine army drew up in a menacing line, Israel deployed to bring down the hammer. The clash of two armies rippled outward drawing more soldiers into the fray. When the dust had settled on round one, Israel was defeated and lost 4,000 soldiers. God’s people were incredulous. The one true God was supposed to be on their side! So how could they be defeated? Israel’s leadership assumed that the symbol of God’s presence, the ark, was too far away. They reasoned that if the ark were relocated and prominently positioned in the middle of the battle, this would better leverage God into acting on their behalf. In essence, Israel felt she needed to improve her technique for manipulating God. God is not to be manipulated. Round two of the battle betrayed the flaw in their logic: Israel was thoroughly routed – 30,000 Israelite infantrymen were slain, the scattered remnant of the army went AWOL to hide in their homes, and the ark was captured by the Philistines. To be clear, the Philistines did not defeat God, they defeated a nation that thought God can be manipulated. God was teaching His people a lesson and using the Philistines as an instrument of His instruction. But once the Philistines carted the ark to the city of Ashdod, it was their turn to attend the School of Yahweh. Dagon was a grain and storm god worshiped by the Philistines. (I’m not sure the artist’s rendering above really captures him.) The Philistines brought the ark to Dagon’s temple and put it on display. Early the next morning, Dagon was discovered face down before the ark of God. The Philistines promptly propped up their god. With the following sunrise, Dagon was back on the floor, prostrate before the ark. Only this time, his head and hands had been removed and unceremoniously plopped on the threshold to Dagon’s front door. The one true God was making a bold and inescapable declaration of Dagon’s inferiority and utter powerlessness: "Dagon can’t keep his head on straight. He can’t even lend you a hand because his are missing!" The Philistines may have bettered Israel in battle, but their god was no match for the God of Israel. The Philistines had assumed they could add Yahweh to their collection of gods. After what they heard God did to Egypt in the ten plagues, they assumed it was a smart move to get Him on their team with Dagon. They assumed wrong! God didn’t knock Dagon down out of spite or a bruised ego – but to make a point: Dagon is nothing. He cannot even right himself when tumped over. Even a mere child learning to walk can do more than this. Giving ANY allegiance to such a pitiful god is worse than pointless. God was doing the Philistines a great service, showing them that their trust was placed in a dead lump of stone. The facts were clear – devotion to Dagon is dumb! (Like Dagon!) Alas, the Philistines had trouble accepting the facts, so God had to sign them up for some remedial education: “Now the hand of the Lord was heavy on the Ashdodites, and He ravaged them and smote them with tumors, both Ashdod and its territories. When the men of Ashdod saw that it was so, they said, ‘The ark of the God of Israel must not remain with us, for His hand is severe on us and on Dagon our god’” (1 Samuel 5:6–7). Amazing! The Philistines recognize that Yahweh is having His way with Dagon, yet they persist in revering him as their god. Sometimes men don’t get it when the facts are staring them in the face. Devotion to Dagon wasn’t just stupid, it was working their harm. An outbreak of some sort of genital tumors was laying waste to the citizenry because they refused to acknowledge the one true God. The people of Ashdod passed the ark of God to Gath like a hot potato. Same result. So Gath forwarded it to Ekron. Ditto! There was mercy in all this – God did not utterly extinguish the people. But the plague was severe enough to get everyone’s attention and raise the question, “Is worshiping Dagon doing us any good?” Not! This was not an isolated incident. It simply illustrates the rightful place of God in our lives. In different words, Jesus once said the same thing of Himself: “If anyone comes to Me, and does not hate his own father and mother and wife and children and brothers and sisters, yes, and even his own life, he cannot be My disciple. Whoever does not carry his own cross and come after Me cannot be My disciple” (Luke 14:26–27). Jesus is not advocating familial hatred. He is declaring that not even devotion to parents, or spouses, or children, or siblings, or self can be allowed to compete with one’s allegiance to the Lord alone. When devotion to one’s children, or devotion to one’s spouse, or devotion to onself opposes devotion to Jesus, the consequences are severe and eternal. God does not do this out of spite or a bruised ego, but to help us. He wants us to learn that giving priority to anything or anyone other than Himself is vain and harmful. The Dagon Debacle is a case in point. Our true good is found in loving the one true God alone. True, there are times when God denies us good things as a consequence of our failures. Being cast from the Garden of Eden is a preeminent example. But not every unfulfilled longing signals God’s displeasure. Quite the opposite! Sometimes God withholds the good He intends for us, for a season, in order to prepare us to receive His gifts. This deprivation is not a penalty but a blessing, a gift God bestows on those in whom He delights. It is designed to help us see what life is like without God’s good gifts, so that when those gifts are delivered, our praise soars. This form of blessed deprivation can be clearly seen in the Garden of Eden. Shall we take a stroll? Genesis 2 provides an expanded account in narrative form of the events that were summarized in Genesis 1:26-28. In Genesis 2, God functions as a father. He brings Adam into existence, assigns him a place in life, gives him vital guidance and counsel, and then provides him with a suitable wife. The genealogy of Jesus found in Luke affirms God’s fatherly role when it references Adam: . . . Enosh, the son of Seth, the son of Adam, the son of God (Luke 3:38). I find the process that God employs to provide a wife for his son singularly instructive. God could have taken a very different path. He could have created the man and woman simultaneously or formed the woman from Adam’s rib mere moments after Adam’s creation. Instead, man was created first. Although everything God had created to this point was good, it was decidedly not good that Adam was alone. Then God arranged for the man to embark upon a search for a solution to his “alone” problem. Adam’s heart was now prepared to receive God’s gift. God tells Adam to take a nap, then creates woman, and finally wakes up Adam for the big reveal. When God presents Adam with his bride, Adam is beside himself (I couldn’t resist!) and exclaims: “This at last is bone of my bones and flesh of my flesh; she shall be called Woman, because she was taken out of Man” (Genesis 2:23, ESV). Did you catch the terms translated “at last” by many English translations? (The Hebrew is ha pa-am.) Adam takes a deep breath and says, “Finally!” Adam is relieved and overjoyed. His bride is perfect and more than worth the wait. By God’s delay to solve man’s “alone” problem, Adam’s heart was prepared to greet God’s gift with greater joy. Does God know how to give perfect gifts when the time is just right, or what? Israel was about a month and a half into it’s journey from the Red Sea to Sinai when the grumbling broke out: “There was good grub aplenty in Goshen - but a big nothing here in the wilderness.” Instead of giving these whiners what they deserved, God served up a hearty helping of grace for the journey! The miracle of manna was less flashy than the Egyptian plagues and Red Sea Victory, but it was a wonder, the original wonder-bread! Manna tasted like honey wafers and sustained the people of Israel for all of their wilderness camping adventure. Near the end of his life, Moses reflected on the manna project and recalled, “And He humbled you and let you be hungry, and fed you with manna which you did not know, nor did your fathers know, that He might make you understand that man does not live by bread alone, but man lives by everything that proceeds out of the mouth of the Lord” (Deuteronomy 8:3). Notice the sequence – hunger first, then satisfaction. God had a plan all along. He knew exactly what He intended – to take care of His people by supplying them with daily bread. And He could have easily provided manna from the very first day of Israel’s journey. But He did not: He dished out a hearty helping of deprivation. For 45 days, God required Israel to experience first hand what trying to live off the land was like when said land is a desert. Why did God do this? God wanted Israel to learn something profound: The presence or absence of resources (like bread) does not make the difference in how (and if) a man lives. Whatever God says does. I am intrigued by something else. A period of going without was part of God’s preparation of Israel to receive what He intended to give them. Deprivation allowed them to appreciate manna for what it was, something unprecedented; something spoken into existence by God Himself; the precious gift of life. Manna was not just an improvement in wilderness life. It was life and Israel’s previous campaign of “45 days of hunger” proved it. This incident provides a window into how God operates. He often withholds the good He intends for us, for a season, precisely because He is using deprivation to prepare us to receive His gifts. When we are ready, when we will receive His gift with the joy of a famished man given bread, He will speak into existence what we need. The beauty of the desert lies in how it readies the heart. Do not despise your sojourn in a barren land. It is preparing your heart to receive what can only come from the good hand of God. Is it a good idea to be good for goodness sake? There is optimism and then there is blind optimism - and I appreciate Despair's attempts to put the latter in it's place. It is comforting to know that at least someone can see through a positive outlook that lacks a foundation in fact. Many people imagine that the only way to be good in this world is through belief in a god. But is that really necessary? Must we be bound by moral dictates set down in “sacred” texts written hundreds, if not thousands of years ago? Must we accept the authority and judgments of “spiritual” leaders and religious hierarchy? Does religious faith offer the only lens through which to judge life’s events? The answer to these questions is no! There is another way for us to approach life. We can have ethics and values that aren't set in stone. Our ideals and principles can evolve over time to reflect our ever-changing and increasingly complex world. Yet, we can be confident of the decisions that we make, not because someone told us what to do but because we relied on our own careful reasoning and emotional reflection. We can live a life that accepts and appreciates the world as it is, without needing to see supernatural explanations behind every event. This is a positive and uplifting way to live. Okay, L-W crowd, what's your assessment? Is this an attempt to gin up a sunny outlook without the sun? Is this the kind of fluff that Despair, Inc., would lampoon? Are the above two paragraphs populated by straw men? Is this a viable candidate for a "positive and uplifting way to live?" Some of you have been reading Light-Work for too long without comment. It's time to weigh in and test your reflexes. How would you respond to someone who espouses this view? Just in case you're procrastinating with this project, here's another motivating poster from Despair, Inc.
May I Puke for You? I am serious! 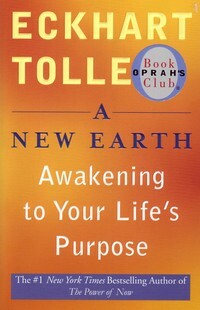 I was walking through Wal-Mart last week and saw Eckhart Tolle's latest, A New Earth: Awakening to Your Life's Purpose. This is the book that is creating quite a stir - check out a previous post for some background. I stared at the thing on the display rack and then decided, "How can I NOT buy this, in light of Proverbs 18:13?" Solomon declares: He who gives an answer before he hears, it is folly and shame to him (Prov. 18:13). There is lots of criticism flying around associated with this book and Oprah's self-appointment as an evangelist for its message. The criticism may well be justified. But for me to pile on without having obtained a clear first-hand report of what he is teaching would be foolish and shameful. When we violate the Prov. 18:13 principle, it bugs the stew out of those proposing alternatives to Jesus. They catch our invective and ask, "Well, have you read it?" When we say, "No," it DOESN'T MATTER whether our criticisms are valid, or whether our logic is sound, or whether we are even RIGHT! All the other is hearing is a prime example of speaking out of ignorance. Our criticisms may be valid, but our credibility just went out the window. So I made my purchase and will not give an answer until I have heard what the man has to say. That being said, I am also willing to wade in on your behalf. What I have read so far lets me know that this offer is no small thing! (I am already feeling a little woozy.) When I post the results here at light-work, I will attempt to pull together first hand evidence from the book that allows you to hear what Mr. Tolle has to say. THEN, you can give an answer based on what the author actually says. Is The Secret a suitable motivational resource for Christians? Isn't some "positive thinking" valuable for believers facing a challenge? If you are unfamiliar with The Secret, check out the previous two posts. The first examines its core philosophy; the second examines its view of God. Both examinations conclude that, at a fundamental level, The Secret and a biblically informed world-view are polar opposites. In which case, I would look elsewhere for material for my next motivational pep-talk. So when we come to 1 Sam. 14, Israel's army has a total of two iron swords, one for King Saul and one for his son, Jonathan. Jonathan decides one morning to go on a little scouting expedition (along with his armor-bearer). They spy out a Philistine garrison and Jonathan gives "the big speech:" Then Jonathan said to the young man who was carrying his armor, “Come and let us cross over to the garrison of these uncircumcised; perhaps the Lord will work for us, for the Lord is not restrained to save by many or by few” (1 Sam. 14:6). Here's what I really like about Jonathan's pep-talk with his armor-bearer. He discerns what they CAN do and what they CAN'T. Jonathan knows that it is his choice about whether to use his sword to fight Philistines or not, and He looks to God for guidance about what choice to make. Jonathan also knows, however, that God will choose the outcome, and His choice will not be constrained by circumstances or numbers. What happened next? God made it clear that Jonathan should use his sword to battle Philistines. About twenty men fell before his blade. Then God shook things up with an earth-quake. Confusion rippled through the Philistine camp, and everyone with a sword (no shortage of swords in the Philistine camp!) used it against a fellow Philistine. When the dust had settled, "the Lord delivered Israel that day" (1 Sam. 14:23). Jonathan did not get confused about who does what. He didn't try to psych himself up. He didn't say, "If we just believe in ourselves, we can win." He was quite clear that victory did not depend on his ability to convince himself he had the right stuff. He deferred to and relied on God. Jonathan was bold in the knowledge that if God decides to work, then it doesn't matter who has more swords. It only matters who is following the Lord's direction. Your ability to psych yourself up is not the key to success. Success is doing what God directs, regardless of how things look. The Secret is no secret! Millions are buying it (literally). What is it's appeal? This life philosophy answers to the natural dispositions of the sin sick heart like hand to glove. If you haven't done so already, check out this series of quotes from the DVD. These statements have a familiar ring to them like something you would have heard in the Garden of Eden where the serpent's mantra was "You will be like God!" A desire to be like God can be of two types. One is good, the other is bad. It is possible to desire to be like God as children desire to emulate their father. This is exactly the kind of appeal Paul makes in Ephesians 5:1 when he says, "Therefore be imitators of God, as beloved children." The bad kind of desire to be like God is the desire of the upstart, the one who longs to become God's equal, His rival, or His replacement. This is what Satan was pitching and The Secret has taken a page from his play-book. I don't care how much you dress up The Secret in biblical terminology or attempt to find points of connection between it and biblical truth, you will not be able to escape this most fundamental difference: The Secret and biblical truth have as much in common as Satan does with God. It gets worse! When the dust settles on the book of Job, God makes this statement to Job's three "friends:" "For this reason my wrath is kindled against you [Eliphaz] and against your two friends, because you have not spoken of Me, what is right" (Job 42:7). Do you like it when someone misrepresents you, or makes public statements about you that aren't true? God doesn't either. When we talk about God, who He is and what He is like, we better get it right! It is here that The Secret says what would kindle God's wrath. Let me pinpoint some of these misrepresentations. God is omnipresent, but he is also transcendent. This means that God is everywhere, but that He also dwells OUTSIDE of time and space. The Secret doesn't get this and conceives of "God" as a synonym for the universe. Second, there is a denial of the personhood of God in The Secret. God is presented not as a person, He is a force. (Haven't we heard this somewhere before, Obi-wan?) This is an important issue for the purveyors of The Secret because a force is capable of being manipulated (like electricity) in ways that a person (who has a will) is not. Third, there is a denial of the sovereignty of God embedded in The Secret. God is the controller of circumstances. He is bound by no man and chooses what He deems best to suit His perfect purposes. "Place the attention on what you want to experience" all you want. In the final analysis, God decides what will happen, not you! Yes, it is true that God can choose to fold our desires into His plan, but "thinking positive thoughts" don't have much to do with it. Praying to the God who is in charge, does. Now, you would think that with so many strikes against it, The Secret would be something that followers of Jesus view as glaringly flawed and unsuitable for their spiritual growth. Surprise - there are saints who are like Luke Skywalker. "I see the good in The Secret." Let's figure out what's going on here, on Monday. GM gave me a copy of a DVD called The Secret. She asked if I had heard about it. Should I? Isn't it supposed to be a secret! (Ba-dum - shhh.) According to the official website for The Secret, the DVD is a companion to the book by the same name. The video has been "seen by millions" and there are over 6 million copies of the book in print. I am not being cynical about it; but if this is a secret, it is one of the worst kept. Rhonda Byrne is the author of the book, the force behind the DVD, and the one attributed with "discovering" the secret. The website makes no modest claim about it: "The Secret reveals the most powerful law in the universe. The knowledge of this law has run like a golden thread through the lives and the teachings of all the prophets, seers, sages and saviors in the world's history, and through the lives of all truly great men and women. All that they have ever accomplished or attained has been done in full accordance with this most powerful law." So what is it? Here's my executive summary: The secret is based on the law of attraction, the principle that our thoughts are like magnets attracting what we think about. Think bad and you will attract bad outcomes. Think good (like money, power, and success) and you will attract good outcomes. The universe is like a powerful genie (although not a person) that will bring into your life what you think about. On the surface, this may seem like just another refrain of the song, "Don't worry, be happy!" But there is something deeper and deeply disturbing going on here. I have compiled a series of quotes from the DVD that you should find illuminating. One of those quotes well captures my concern: "You are eternal life; you're source energy; you are God manifested in human form, made to perfection." Where have I heard something like this before - oh yes, the Garden of Eden! The serpent said to Eve, "For God knows that in the day you eat from it your eyes will be opened, and you will be like God, knowing good and evil" (Gen. 3:5). Satan drank the Koolaid and believes he can be like God, and here we find him at the dawn of human history trying to sell Eve on the juice. At its heart, the Secret is anything but. It is a lie as old as time - We can be the controllers of our destiny; we can determine what life will give us. I have more things to say, but I would like you to do a little homework first. Download the series of quotes from the DVD. Then fix Satan's mantra in your mind: "You will be like God." Now read the quotes and see if they don't sound alike. If they do, here's what ought to give you pause. When Satan first introduced his philosophy, he called it a secret. "God has been holding out on you, Eve. But, I am here to dispel his repression by telling you THE SECRET - YOU CAN BE LIKE GOD." A Direct Connection with God? Preparing youth for the art of jihad is the noble educational goal of the Pakistani madrassa. So claims Rep. John F. Tierney, Massachusetts Democrat and chairman of House Oversight and Government Reform, as quoted in a Washington Times article, "Jihadist Training Ground?." A star pupil at the Arabia Taeem-ul-Quran school is featured in the article. Muhammad Asher, age 15, can recite from memory the entire Koran. The curriculum at Muhammad's madrassa is uncomplicated: Between three meals and five times of prayer a day, memorizing the Koran is the single goal. Nothing else is taught, including basic reading skills. Students like Muhammad are the kind of recruits who are actively sought by extremist factions. They have the right stuff to take lives with religious fervor. Muhammad is quoted explaining, "When I pray and study, I feel a direct connection with God. It takes away all my fears. I'm only afraid of God." Is he right - is his experience an encounter with God? Or is it something else? There is little doubt in my mind that God is NOT talking to Muhammad. The marvel, to me, is that Muhammad thinks He IS! If Muhammad is fast-tracking to become one who dishonors God by taking life, not protecting it, his claim to a direct connection with God betrays a serious hearing problem. Perhaps this is a clue to what will happen as we near the end. Men's penchant to re-label terrorism as "service to God" will wax large. Jesus told us this would happen: "An hour is coming for everyone who kills you to think that he is offering service to God. These things they will do because they have not known the Father or Me" (John 16:2-3). There will come a day (for many that day is already here) when following Jesus is a matter of life and death. Don't be surprised when persecution is administered by those who know neither Jesus nor the Father, but who think they have a "direct connection to God." This is really weird! I'm reading a passage in the Bible that has nothing to do with me and suddenly a verse pops off the page. It's like someone has been reading my mail! Or my Mind!! Is God talking to me? It could be! God can communicate with us lots of different ways. But because we are not very good at recognizing His voice, it is a really good idea to ask, "What confirmation do I have that this is God talking to me and not just me talking to myself?" The best possible confirmation is Scripture. Remember the Bereans? Some guy named Paul came to town declaring, "I have a message for you from God." So where did they go for confirmation? The book of Acts answers, "Now these were more noble-minded than those in Thessalonica, for they received the word with great eagerness, examining the Scriptures daily to see whether these things were so (Acts 17:11 - NASB). Here's the best possible way to confirm that what has popped off the page is something God is saying to me: Find the message repeated elsewhere in His Word. So, I ought to examine the Scriptures to see if there is a clear biblical basis for what I think God is asking me to do in the verse that pops. If there is, it's time to take action. Here is a rich and interesting "confirmation principle." It comes from Jesus who declared, “If anyone is willing to do His will, he will know of the teaching, whether it is of God or whether I speak from Myself (John 7:17 - NASB). It is NOT POSSIBLE for a man who is resisting God to receive confirmation. My only hope of certainty about the source of a message (from God or not?) lies in meeting a prerequisite. I must have already issued God a blank check. I must hold my heart in a place where it can say, "I am willing to receive from your hand whatever You want to give me, even if it is not what I would choose for myself." The man whose heart says this is a candidate for confirmation. The man who cannot say this will not be able to confirm the source of something that might well be from God. How scary is that - to have a word from God in your possession, but to be unable to validate that it is from God? Let's extract two other insights from this passage. How can you know whether you have issued God the aforementioned blank check? Once again, we are brought back to Scripture. The man who is "willing to do His will" is the man who is obedient to everything he already understands from Scripture. There is not an issue of glaring disobedience in his life that voids his blank check. Second, notice the "if/then" elements in Jesus' statement. "If anyone is willing, . . . [then] he will know." This is God's announcement of a partnership. Remember (see yesterday's post) that the Moses, Balaam, and Belshazzar accounts all reveal something about our God. He is aware of men's need for confirmation and willing to take steps to address it. This is something truly marvelous about our God. It fills me with joy and wonder. God WANTS me to know what He thinks! Most important people don't consider me worth their attention. But God does! In John 7:17, there is an implicit promise from God: If I am willing to do His will, He will take care of the confirmation problem. When we get down to it, God's commitment in this regard is a life saver. (Literally!) No man has within himself the capacity to validate God's Word. Only God can do that! So, when God says that the man who is willing to do his will is a guarantied recipient of confirmation, He is pledging Himself to provide that confirmation. How will He do that? That's HIS department, so I can't say - but I know that the means could be as varied as a stick that becomes a snake, a talking donkey who can explain danger, and access to a man of God who knows how to read the handwriting on the wall. There are more confirmation principles, but I imagine I have said enough to stir up the pot. If the pot gets to bubbling, I might add a post-script next week. Have a great Thanksgiving! Suppose you are reading a passage that seems to have nothing in common with a situation you are facing. But when you read a certain verse, the words are written in neon. They appear to speak DIRECTLY to a situation you are facing. Could the breath-taking "connection" between this verse and your circumstances be God's doing? Is He the one behind the connection and is He trying to tell you something? The first thing we MUST admit is our ability to fool ourselves. There is something inside of us that wants God's stamp of approval on the things that self wants. The liability of this suspect motive can be compounded by the fact that we aren't that smart. Our minds are capable of finding a reasonable explanation for nonsense. So we have the limitations of two of Dorothy's friends all rolled into one: We have neither the heart nor the brain. We aren't equipped to declare, "This IS God speaking." So, while we admit the possibility that God COULD be speaking in the neon verses, our healthy distrust of our heart and mind requires us to seek some external confirmation. This heart and mind limitation comes as no shock to God. So, we can take some refuge in the knowledge that IF God is speaking through our neon verses, He is aware of our need for something FROM HIM that we cannot supply ourselves, the confirmation that He is the one speaking. In Part 1, I mentioned three examples of "unorthodox" modes of divine communication, a burning bush, a talking donkey, and handwriting on a palace wall. In all three instances, these "neon experiences" were not encountered in isolation. There is a "ministry of confirmation" which God provided to the recipients of these messages. Let's check 'em out. At the burning bush incident recorded in Exodus 3-4, Moses was commissioned by God for a tough assignment. Was Moses exasperating God by his list of objections? Perhaps, but God DID give to Moses confirmation that this commissioning was not a mirage. A rod that became a snake (and could be returned to its original state) and a hand that became leprous (and could be returned to a healthy condition) were graphic elements to this ministry of confirmation. In the case of Balaam, his talking donkey experience was confirmation of previous instances where God spoke. Check out Numbers 22. In round one, God "came to Balaam" and said, "Do not go with them; you shall not curse the people." In round two, God "came to Balaam at night" and said, "Go with them, but only say what I tell you." This was followed by a "three-peat" of "when good donkeys go bad." The climax was being rebuked by his donkey and then reprimanded by the angel of the Lord. Clearly God was unhappy with Balaam, but God DID leave no room for human error about the fact that God was the one doing the talking. The "handwriting on the wall" incident recorded in Daniel 5 is interesting for the way in which God used two individuals as separate halves of a decoding mechanism. Belshazzar received a written message from God at a party. The meaning of the message hung in doubt until Daniel, a man of devotion to God and a man with a proven track-record of sorting out divine mysteries, was ushered to the scene. Daniel explained what was a message TO the king but FOR everyone else. The credibility of Daniel vouched for the authenticity of the message, as did the events of that evening. Here is the take-away from these accounts. If God wants to speak to us through a neon passage, He is more than aware of our limitations of heart and mind and of our need for confirmation that HE is the one speaking. These passages show us that He is willing to provide that confirmation, to someone who balks at receiving a tough assignment from God (Moses), to someone who is toying with "doctoring up" his orders (Balaam), and even to someone whose party was "the last straw" of defiance against God (Belshazzar). If God is willing to provide confirmation in these accounts, then how much more so when someone has a heart for the things of God. It seems reasonable that if God wants to speak through a neon verse, that blinking neon will be accompanied by something else to assure us we are not just seeing things. JG strikes again! She made a comment in the Jer. 29:11 series that raises a whole new issue. She wants to know if God can direct you using a passage that "isn't particularly relevant to your situation, but the wording is such that it seems to grab your attention. Maybe there are words or phrases that describe what you are feeling or dealing with, words that only you and God would recognize as significant." The short answer is, "Of course, He can!" God is perfectly capable of guiding and directing us through an infinite array of methods. A burning bush, a talking donkey (not from Shrek! ), and handwriting on a palace wall come to mind. So if God is able to use shrubs, livestock, and billboard calligraphy to get our attention, it seems perfectly reasonable that He could use a passage from the Bible to direct us, even a passage that was written for a different purpose to a different people facing a different situation. God does not answer to us, and He is free to use His Word as He sees fit. God is able to provide individual guidance for us on His terms and to crystallize that guidance in language that echoes biblical terminology from passages only indirectly related to our situation. God's ability, however, is not the problem. OUR ability is. How do we KNOW that God is the One speaking, when "the wording is such that is seems to grab [our] attention?" Yes, God can speak through a passage in the manner JG describes, but how can we distinguish the times when He is speaking from the times we mistakenly think He is speaking? There are quite a few threads we must trace to unravel this ball of string. Let's start with a sober assessment of our capacity for self-delusion. It is possible to be absolutely convinced that God is saying something to us and to be wrong! Let me bring a few sample verses and comments to the table as evidence. Jer. 23:25 - I have heard what the prophets have said who prophesy falsely in My name, saying, 'I had a dream, I had a dream.' It is possible to have a dream and to use that dream, either unwittingly or consciously, as evidence that "God has spoken to me." By such means, a man attempts to put words in God's mouth. Jer. 5:31 - The prophets prophesy falsely, . . . and My people love it so! It is possible for men to applaud when God's words are misrepresented; they actually prefer a message other than God's. Jer. 42:6 - Whether it is pleasant or unpleasant, we will listen to the voice of the Lord our God to whom we are sending you, so that it may go well with us when we listen to the voice of the Lord our God. This really sounds convincing! But in context, these words are the people's mis-representation of themselves. They didn't want divine direction, they wanted God's endorsement. This little charade was a means to get God to back a plan of their own invention, to get his stamp of approval on what they had already determined to do (see Jer. 41:17-18). The bottom line is that verses like these tell us about what men are capable of, and it's not pretty. We have every reason to distrust our ability to identify God's voice. So let's start our discussion (more next week) by affirming this, JG. God can speak to us as He chooses, but we have good reasons, biblical reasons, to be suspicious of our ability to distinguish His voice from the desires of self. There is something inside us that wants to cloak personal desires in robes of respectability by draping them with biblical terminology. Proceed with caution! During our recent extended vacation, we attended church #3 on the 2006 CR list of most influential churches. (By the way, notice that former Collierville Bible Church youth pastor, Tim Lundy, is leading church #26 on the list - way to go, Tim!) We also attended several other mega-churches that are following the paradigm pioneered by churches like Willow and Saddleback, the trend setters emulated by thousands of contemporary churches across the globe. Because so many churches draw from this model, it is significant that an important Willow insider like Greg Hawkins has uncovered a disturbing truth. Hawkin's report, according to Bill Hybels, is a shocker and capable of producing sleepless nights for pastors, including himself. I applaud Willow Creek for being willing to ask tough questions of themselves. The book which captures insights from the study, titled Reveal, Where are You?, promises to send shock-waves of paradigm shift throughout the franchise. I find Reveal interesting as an explanation for the numbers of mega-church refugees who come to Collierville Bible Church longing to go deeper with God. I wonder if it will also become for thousands of churches the "next big thing." Is baptism for the dead a live option? KS wants a comment from Bible Answerman! I came across a practice I didn't remember seeing before in 1 Corinthians. Paul is making the case for the resurrection. As he bolsters his argument, he mentions that it would be no good to be baptized for the dead if there were no resurrection. Hmmm. Is he promoting or condoning this practice, or just appealing to applied logic in this misguided practice. In the text, I can't detect any criticism on Paul's part. Help? Great question! This passage reads: "Otherwise, what will those do who are baptized for the dead? If the dead are not raised at all, why are they baptized for them? (1 Cor. 15:29). This is a tough verse to sort out, to be sure - Gordon Fee cites a dissertation (in CBQ) by B. M. Foschini that mentions 40 different explanations. Could be interpretive quicksand so let's find some safe ground. We will first identify what we do know, before speculating about what we don't! The terms, "baptized," "for," and "the dead," are fairly straight-forward in their meaning. They most naturally refer to being baptized on behalf of others, perhaps believers who died prior to being baptized. Whatever the phrase refers to, it was something currently being practiced by some in Corinth. KS is right that the context of 1 Cor. 15:29 is one in which Paul is marshaling evidence for the resurrection. This verse marks a transition to a different class of "evidence" for the resurrection, "practices which only make sense in the light of a sure resurrection." Verses 30-32, for example, make the point that putting one's life at risk for the cause of the gospel is absurd unless there is a resurrection. This does not constitute "proof" of the resurrection, per se, but behavior which can only be accounted for by a hope of resurrection. Although Paul does not explicitly condemn the practice of which he speaks ("baptism for the dead"), he does put some distance between it and himself - he says "what will those do" - NOT "what will we do." The contrast between "those" and "we" is even more striking for the fact that Paul uses "we" in verse 30. Makes you wonder who this "third party" might be! An important third party is expressly identified in 15:12 as "some among you [who] say that there is no resurrection of the dead." These are the ones whose negative influence seems to be the catalyst for Paul's lengthy defense of the resurrection of the dead that is the focus of 1 Corinthians 15. The biggest objection to a straightforward reading of 1 Cor. 15:29 (see point 1 above) is this: How could Paul mention vicarious baptism without condemning it? Clearly, he would condemn it. So why didn't he? Here is a reasonable and viable explanation. I cannot say with absolute certainty that this is the explanation for Paul's argument, but it shows that a reasonable explanation is possible. Suppose the third party mentioned in 1 Cor. 15:12 (who deny the resurrection of the dead) is the same third party mentioned in 1 Cor. 15:29 (who practice vicarious baptism). What a compelling argument Paul has then constructed! He is able to find powerful evidence for the resurrection of the dead among those who deny it. Why condemn the practice of baptism for the dead when he can cite it as "behavior which can only be accounted for by a hope of resurrection" (see point 3 above)? So, KS, here's my basic answer: In 1 Cor. 15:29, Paul mentions the practice of vicarious baptism (this is the plain meaning of the terms involved), but not because he approves of or endorses the practice. He mentions it because it is a prime example of the hypocrisy of those whose denial of the resurrection of the dead is betrayed by a practice of baptism that assumes the dead will live again. Paul is saying: "Even those who deny the resurrection of the dead don't believe their denials! So, why should we?" I couldn't agree more!! Does Pain Produce X-Ray Vision? Superman had it. So do other super-heroes. Some super weapons have it, too, like the "rail gun" in the Arnold classic, "Eraser." It's X-ray vision and it seems very cool. But isn't that just the stuff of comic books and movies? Not! X-ray vision is real! I have actually experienced it, and it is way better than the comics. Here's how it works. I can read a passage from the Bible and not see anything special. I am sure there is special stuff in there, I'm just not seeing it. Then, I get immersed in pain. Not the hit your thumb with a hammer stuff, but the emotional pain of rejection, unjust criticism, being misrepresented, and getting in way over my head. When I am in anguish of heart, I can return to the same passage and verse after verse leaps off the page like it was blinking neon. Where did this come from? Why didn't I see it before? Answer: Pain produces X-ray vision! Now don't get me wrong. I am not going to tell you that I LIKE pain. But I will tell you that I LOVE what it produces, the ability to look through the words on a page and see something God wants to show me. I am not alone in this perspective. Here's what the Psalmist says: "It is good for me that I was afflicted, that I may learn Your statutes" (Ps. 119:71). The Bible comes alive when we are afflicted. So whenever I am in pain - I grab my Bible and spy out what God is saying before my X-ray vision wears off! It's bad enough to be sleeping in church. It's especially bad when you're the preacher! Yea, that was me, but I have a very reasonable explanation. We were staying overnight at the "Old Church House" in Oakland, TN. James and Louis Maddox have converted the Oakland Methodist Church building (originally built in 1927) into a fantastic bed and breakfast. Our bedroom was once part of the chapel and included three stunning stained glass windows that soared to the 12' ceilings. During the day, ordinary sunlight was transformed into something truly extraordinary. As evening neared, we enjoyed another work of art in which the artist's medium was light. This was one of those rare sunsets in which the whole sky was ablaze with glory. The clouds were just in the right place to first be cast in yellows and golds, then oranges and reds, and finish with blues and violets. The sunset was God's grand stained glass window. His was not a static display but an animated work of art as clouds moved and changed shape, as one color was replaced by another, and as the crimson disk of our sun deepened in color and grew in size before its departure. This was not a picture, but a light show. I thank the Producer for a great performance from all His troupe. It reminds me that God is interested in making things beautiful. Even me! Even you! This guy is having an amazing streak of luck. He sits at a blackjack table in Vegas and has beat the house 75 straight times. Needless to say, his pile of chips is HUGE and growing. He is definitely getting noticed (especially by casino management) but just keeps raking it in. After 100 straight winning hands, he pushes back from the table and calmly demurs, "That's all for now." No one is this lucky! There has got to be something going on here to account for such an incredible feat of defying the odds. This is precisely the conundrum men face when it comes to Daniel 11. You remember Daniel (the guy who was invited to the Lion's Club for dinner). He was a prominent figure in the Chaldean and Medo-Persian empires of the sixth century BC. He was also an amazing prophet. So, what's going on here? How is it possible for someone living in 534 BC to predict with such precision an extended sequence of events spanning over 300 years? Is something fishy going on here? Or could it be that Daniel actually has a hot-line to God? Heading East toward Amarillo on Highway 40, we weren't expecting this! An attention grabbing bossy wooing the famished to gorge themselves. Draped on the cow's ample flanks are emblazoned the words, "Free 72 Oz. Steak." The big fella is the PR invention of The Big Texan Steak Ranch, RJ "Bob" Lee's legendary Amarillo attraction where over 40,000 have tried, and 8,000 have succeeded. Those whose names are enrolled on the "Wall of Fame" have eaten the required salad, shrimp cocktail, baked potato, dinner roll, and, yes, a four and half pound slab of beef in less than 60 minutes. As a marketing strategy, I can't fault The Big Texan. They got my attention with their bodacious bovine. But I wonder, does something not seem a little skewed here? Is there anyone out there who would champion the benefits (health or otherwise) of such a rapacious act of consumption? What, exactly, has someone gained by "winning" this challenge? The apostle Paul enjoins his prodigy Timothy to fight the good fight. His words suggest that there is nothing good served by fighting well the bad fight, the fight that isn’t worth fighting. His words call us to be selective about hills we are going to die on, the places where we are going to make our stand, the goals toward which we will strive. A HS football coach once told me, “Winners never quit and quitters never win.” I don’t question Coach B's counsel, but I also know that the winner in a contest worth fighting refuses to dissipate his energies in lesser pursuits. So today, I purpose to fight the good fight! I will seek to apply my best efforts to the things most worth doing and avoid the lure of "winning" at what doesn't matter.